Breakfast in our household is one of my favourite times of day, yes it’s crazy during the week getting the kids up, dressed and fed before school but on the weekends we get to take our time. We enjoy leisurely rising from bed whenever we please and everything happens in slow motion. The girls favourite weekend breakfast is always pancakes, I can’t say I am disappointed at this as I love a good pancake myself. 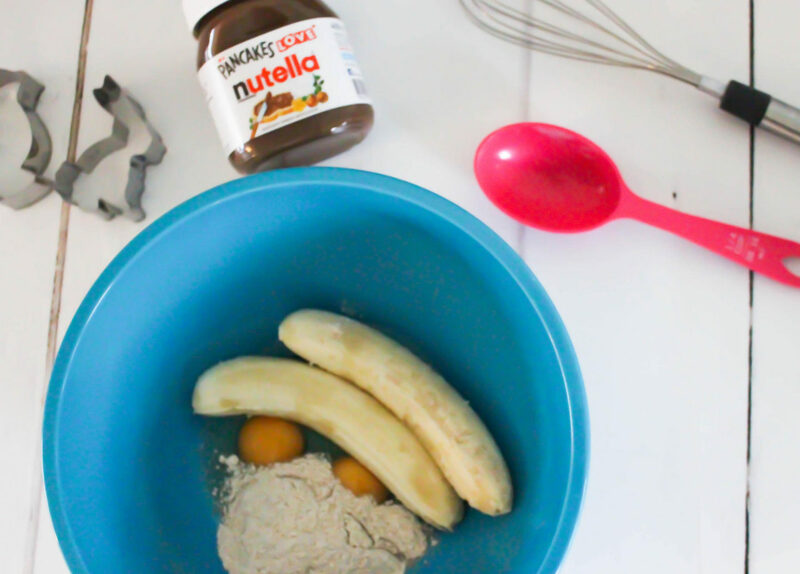 My go to recipe contains just three ingredients and is the perfect way to use up those bananas at the end of the week! 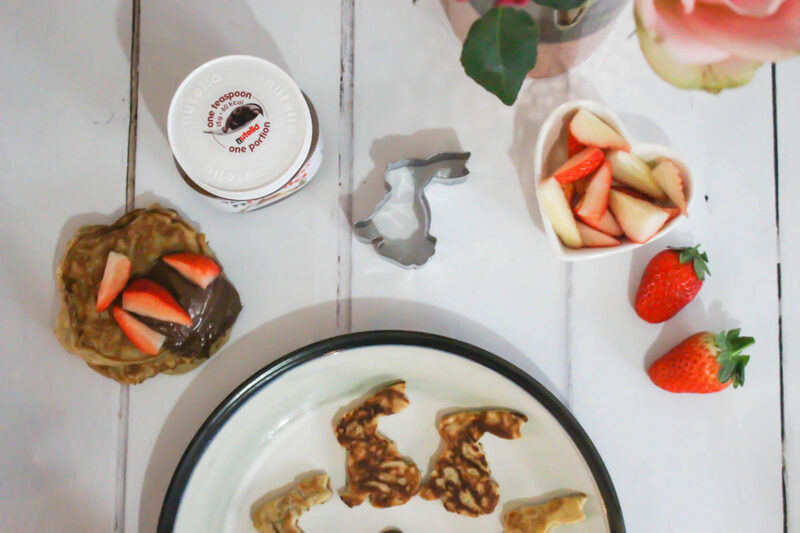 With spring in the air and Easter right around the corner I have given our usual pancakes a little makeover and if there is ever a way to get your children to the table quicker than turning their dish into one of their favourite animals and topping it with one heaped teaspoon of Nutella is the way to do it. 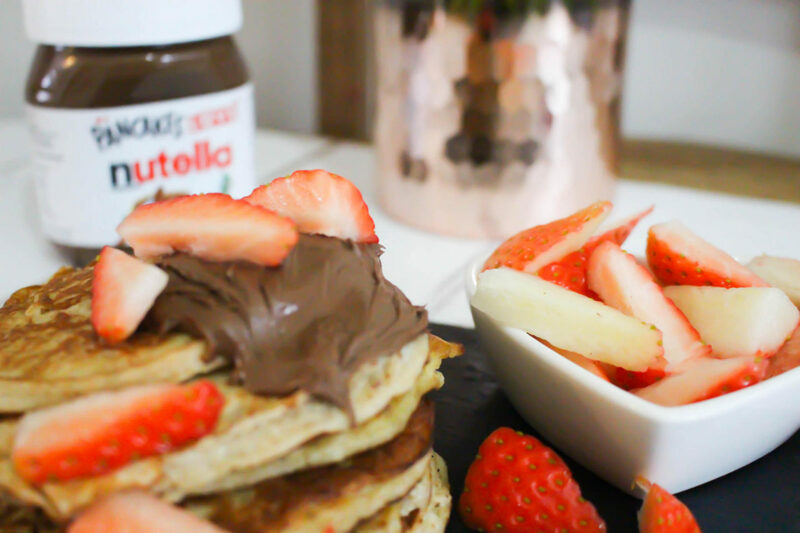 A 15g portion (one heaped teaspoon) of Nutella is a delicious way to spread a little happiness at breakfast. 1 heaped teaspoon (15g) Nutella per person. Fruit and nuts of your choice – we’re having fresh strawberries with ours. In a large mixing bowl simply mash your banana – the riper the banana the better for this. Crack in your two eggs and whisk until combined. Add your wholemeal flour and mix. You will be left with a sticky lumpy batter. 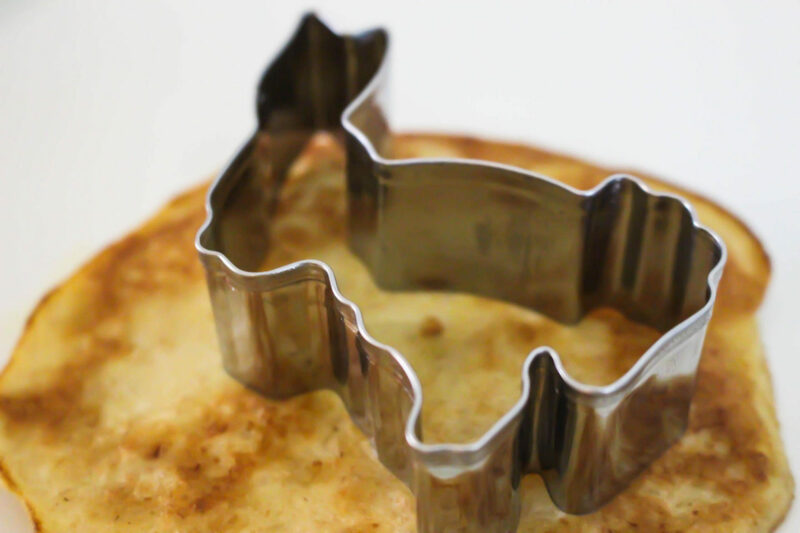 Grease a nonstick frying pan (you can use a rapeseed, veg oil or coconut oil), add 1-2 tablespoons of the batter (I am using a stainless steel cutter here to create the bunny shape for these Easter inspired pancakes). 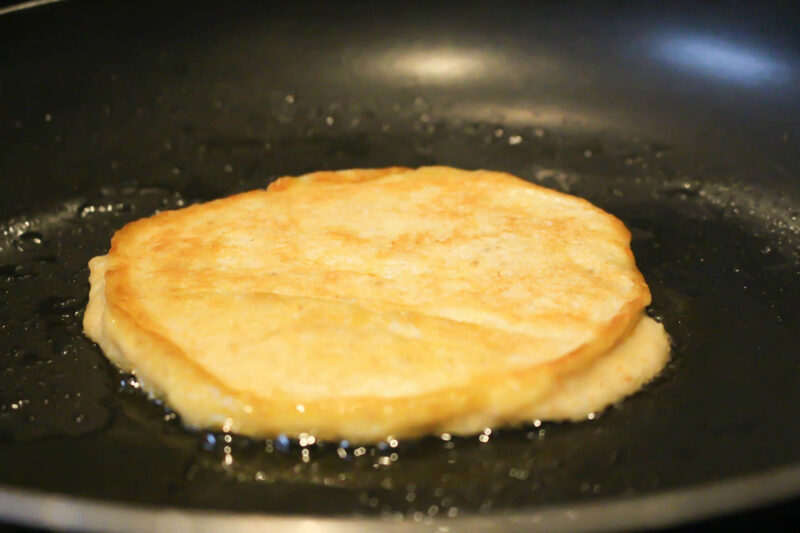 Tip: unlike regular pancakes cook these on at a low temperature (the banana can cause pancakes to burn easily). Cook for 1-2 minutes on each side until golden brown. These do cook really quickly so keep a close eye on it. 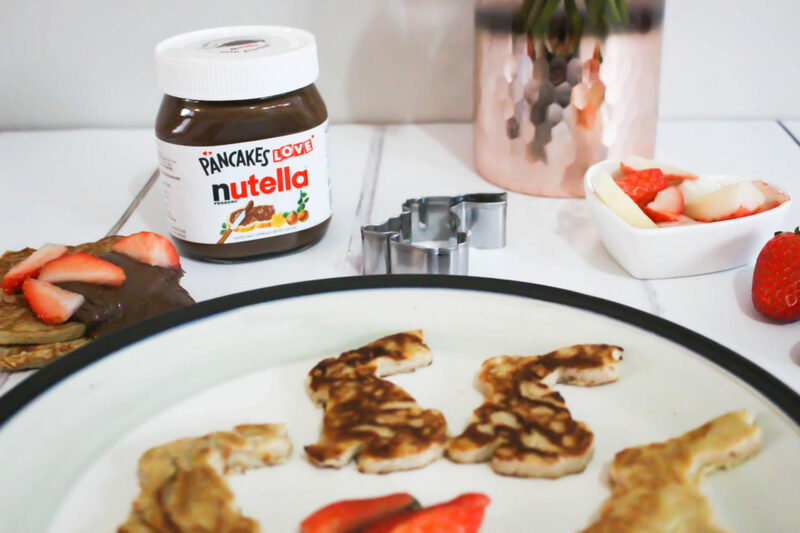 All that is left to do is top these yummy pancakes with a 15g portion (one heaped teaspoon) of Nutella which contains 80 calories and is the perfect addition to this balanced and varied recipe. I love this recipe so much; it is super quick, easy and a varied breakfast for us all but it’s also really versatile. You can add a pinch of cinnamon or ginger to the mix or even some grated apple for that final touch. This post is written in collaboration with Nutella.